The Missouri legislature will be asked to adopt changes that aim to prevent those with a domestic violence history from having guns. 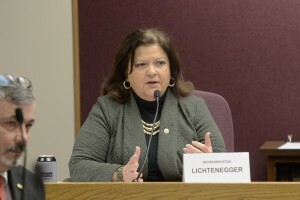 Rep. Donna Lichtenegger (R- Cape Girardeau) wants to expand the crime of unlawful possession of a firearm to include those who have been convicted of domestic violence misdemeanors or who have protection orders against them. The measure strikes a personal chord with Lichtenegger because of domestic violence committed by her father when she was a child against her, her mother and her brother. “This bill was worked out between the domestic violence community and the [National Rifle Association],” says Lichtenegger. The result of legislation passed last year allows such Missourians to have concealed carry permits. The proposal was vetoed by former Governor Jay Nixon (D) and overturned by the legislature. Lichtenegger’s bill also includes prohibitions against gun possession by anyone who is in the United States illegally; has been dishonorably discharged from the military; or has renounced United States citizenship. Colleen Coble with the Missouri Coalition Against Domestic and Sexual Violence supports the proposed legislation. The proposal includes an emergency clause, which if adopted, would make it effective if it is signed into law by the governor. “This is a matter of life and death. We do not want to lose another person due to this horrible, horrible violence,” says Lichtenegger. According to the Highway Patrol, 74% of the 30 domestic violence related homicides in Missouri in 2015 involved a firearm. The American Journal of Public Health said when a gun is present in a case of domestic violence, there is a 500% greater chance of an intimate partner killing his or her partner.